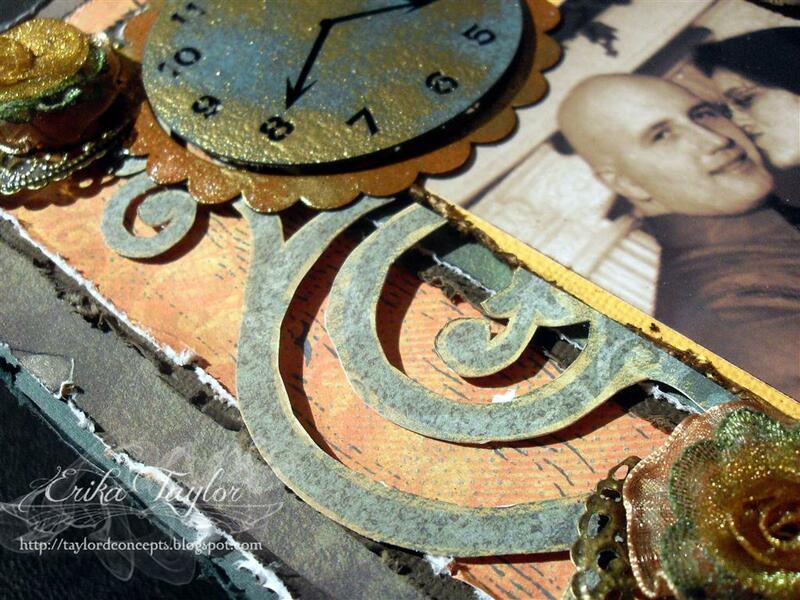 Blog Quick Quotes: Featured Guest Artist - Erika Taylor! Featured Guest Artist - Erika Taylor! We have a special Friday treat for you today! is back with a beautiful layout to share with us. Let's let her tell you all about it!!! I love the beautiful colors in the Tin Type collection. They have a masculine feel to them, but are so easy to use for every occasion. For this layout, I really wanted to create a timeless look and knew that the Tin Type 100 paper would create the perfect background for the layout. I added a little bit of Tin Type 300 and Tin Type 200 and distressed the edges as well. The perfect quote popped out of my stack of Quick Quotes Color Vellum Quotes. 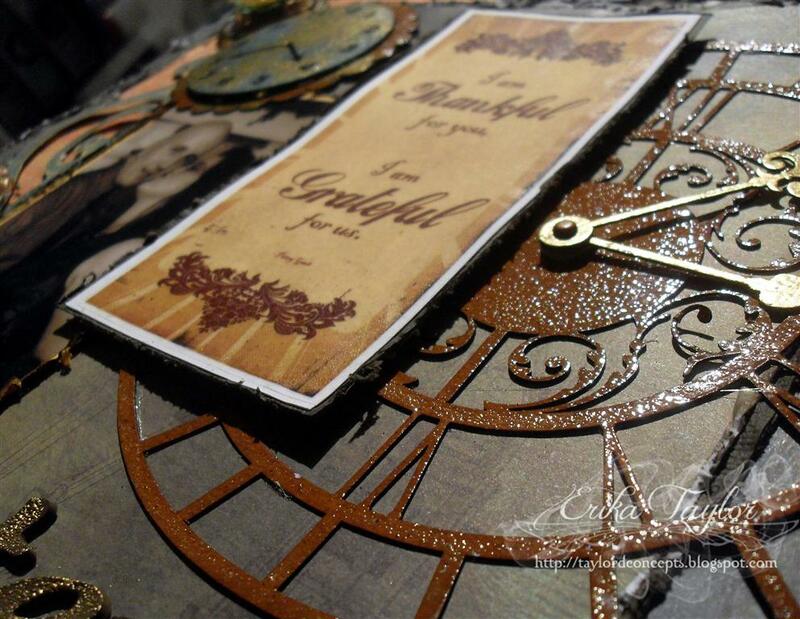 The Copper Kettle I Am Thankful for You quote really encompassed what I wanted this layout to be about. I think the most beautiful part of the layout is the wonderful chipboard elements. 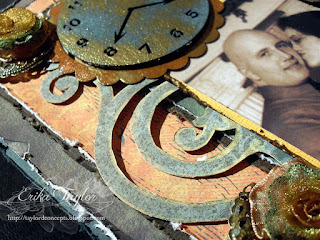 The Clocks 8 x 10 Chipboard really adds that vintage feel I was looking for. I embossed them with WOW embossing powders before adhering them to the layout using Helmar 450 Quick Dry Adhesive. Take a look at the amazing pieces available from the Chipboard, Tin Type and Copper Kettle collections. There are so many beautiful pieces that will find their way into your projects. Thanks so much Erika for sharing your talent and creativity with us!!! I love it!!! Colors and embellishments are stunning! The embossing really adds a great touch. Beautiful layout! Love the mix of floral with heavy timepieces. Ya Erika!!!! Love this gorgeous layout! I NEED those chippies! Just beautiful! Fabulous piece and love the choice of colors! Such a wonderful layout! I love all the details and layering! You did such a great job~love all the chipboard elements!!! I'm a big fan of QQ ink too~it is my go to ink!!!! Nice work, Erika. I like the way the embellishments help tell the story of the photo. The earthy colors are different from "love's" usual red, black, white, etc.